I sat in on the Legal Matters class at SNAP! taught by Danielle Liss, a lawyer who specializes in social media and contract law. I learned so much great info that I really want to recap that class. This post might be so incredibly boring for most of you. But to those of you who are bloggers, I think it’s really important information that you should be incorporating into your job. I’ll try to make it super straight forward and as interesting as I can! If you write any posts in payment or possibly product, you should have a contract. That sounds super formal, I know. But so much as an email exchange can be considered as a contract. I do lots of sponsored posts that don’t all have formal signed contracts, but if it REALLY came down to it (which seems highly unlikely) there would at least be a paper trail. That being said, if you ever enter into an agreement by your own initiative, you should include a contract. And vice versa: if a company requests that you sign a contract, be sure to read through it to see that there are no weird things in there. Term: How long the person will do the work for. Any changes to this must be made in writing. Confidentiality: This means no disclosure of trade secrets or confidential information. Non-Disparagement: Don’t talk badly about the company if things go south. You should ask for mutuality in this, meaning that the company will not talk badly about you. Non-Compete: This means that if someone works for you and learns your trade, you request that they won’t work in your area of expertise for a certain length of time or certain area where you work. 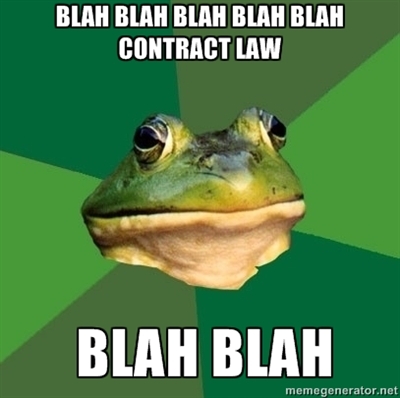 There are a few other legal aspects of a contract but they are pretty, um…boring to explain. So I will skip them. Here’s a great example Danielle used where a contract can protect you. Eg: A company contacts her and asks her to let them use a couple of her cat pictures in her typical style (her cat photography style is VERY strange) for $50. So she sent them a picture of her cat. They were not happy with the picture she sent (being an extremely strange picture) and said, “We cannot accept that picture. You will not be paid.” Now they are in breech of their contract. She did exactly what they wanted–a cat picture in her typical style–and they refused to pay because it wasn’t a good enough picture for them. And because she has it all recorded through emails, she could take them to court and she would win. Here are a few things I learned about copyright. Copyright is the rights you have to an original work. If you take a picture, you own the copyright to that picture. And you pretty much should never assign that copyright to someone…unless they offer you a significant sum of money for it. So if you have a picture you love but someone offers you $20,000 for the exclusive copyright–you could probably be okay selling the copyright to them. (Heck even 10,000.) Assigning a copyright to someone or a company releases all of your rights. You can’t do anything more, even if they use your piece in an undesirable way. You can, however, give someone a license to use your work for a limited purpose. Licenses do not release all of your rights. If someone writes you and asks for you to give them the copyright to a picture they’d like to use, they may not actually know the difference between copyright and a license. You should try and find out exactly what they mean because they are more likely looking for a license. Also if you assign a license to someone but they use it beyond the intended purpose, you can contact them and ask them to cease and desist. And if someone requests an exclusive license, that means you cannot upload your picture to any social sharing site because even once deleted, that picture will remain on Google forever. If you receive compensation for a post (product review or similar) you need to include a disclosure at the end of the post. This is as simple as stating that the post was sponsored by X and Y but all your opinions are 100% yours. Awhile back I made something for myself using a pattern I bought from someone. It wasn’t for profit, I didn’t sell the thing I made, and I make no money from blogging about it/anything. As is my prerogative, I took a picture of the finished project (that I made), put my watermark on it (it was my photo of my project and it was going to live on my blog where I’ve had people steal my photos before and post elsewhere without my permission), and posted it on my blog. All proper credits were given underneath the photo to the pattern designer (including a link to where the pattern could be purchased). A few days later I got some cease and desist letter from her saying that I did not own the copyright to my photo because it was a derivative of her original work and that I could only keep the image up if I changed the watermark on it to HER watermark. ?? Rather than fight it out (I’m no legal expert), I just took the images down and chose not to blog about her pattern and what I had made. I have no idea what the right answer was to that one, but the whole thing made me upset. Skooks–that is completely ridiculous. A pattern maker selling patterns should know absolutely that products of her pattern may appear on the internet. And furthermore, it’s free advertising! Sounds like you did everything right, proper credit, not trying to sell it, etc. You absolutely OWN the copyright to that photo you took because YOU took it. Doesn’t matter if the subject was somehow linked to her pattern, you do NOT have to put her watermark on that. Completely and utterly ridiculous. If it were me, I probably would write back and say “Sorry–but the copyright to this photo belongs to me. I gave you proper credit in the post and was not trying to do anything of a commercial nature with it. If you don’t want people to take pictures of items made from your patterns, you need to have that specifically known before a purchase is even made. I am not going to take my photo down.” I’m no lawyer, but from what I learned last week, you have ever right to that photo. If you want to know for sure, you could email Danielle Liss. Sorry about that, btw. Very interesting issues – thanks so much for sharing. I didn’t find it blah, blah, blah, blah at all, lol! I do need to figure out how to put watermarks on my photos though….